Before it is possible to classify an extraterrestrial civilization, one must be identified. As of today, humans have yet to come into contact with any aliens. However, scientists use an equation called the Drake Equation to predict the number of extraterrestrial civilizations that exist in our galaxy. The Drake take variables such as the number of stars in a galaxy, the average amount of planets that orbit a star, the number of planets that could support life, the fraction of planets life does emerge on, the fraction of life-bearing planets which develop intelligent life, and the number of Intelligent species that create communication technology. Once all the variables are plugged into the equation, it estimates the number of extraterrestrial civilizations that exist in our galaxy. However, more often than not, certain variables are hard to estimate because our only example of life emerging is on earth. Estimates of the number of extraterrestrial civilizations with communication technology range from 1000 to 100,000,000 civilizations in our home galaxy. SETI (Search for Extraterrestrial Life) is a non-profit research institute devoted to exploring and understanding the universe. One of the ways they accomplish this task is by devoting resources to the search for alien civilizations. Alien civilizations are not easy to detect, a point easily made by the fact made we have yet to discover or come into contact with one. As humans have yet to contact extraterrestrials, we must rely on existing technology to attempt communications. Today, SETI sees microwave radar as the most likely way of detecting other civilization. The organization listens for signals of different wavebands, trying to distinguish intelligent signals from the background noise of the universe. SETI also transmits similar radio wavelengths into space, hoping they will be detected. However, because space extends forever in every direction, the targeting of transmissions is random. A common uses metaphor used for such a scenario is SETI is randomly dipping a cup into the ocean and hoping to catch a fish. The speed of light is also a limiting factor when attempting to contact a species thousands of light years away. The nearest solar system to our own is 4.3 light years away. This means it would take 4.3 light years for a signal to reach Alpha Centauri and 4.3 years before a returning signal could be received. A message to the nearest galaxy would take 2.5 million years. 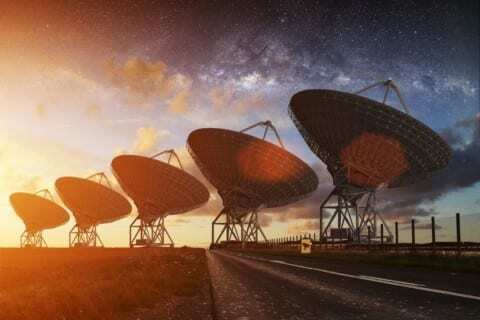 Due to the radio silence of space, it is likely that Type II and III Kardashev civilizations do not exist as they would be the most likely civilization to broadcast interplanetary signals. However, there could be other reasons for the lack of contact. Maybe alien civilizations are rare, or they have refused to contact us. We simply do not know. Contacting Extraterrestrials by Abigail is licensed under a Creative Commons Attribution-ShareAlike 4.0 International License.